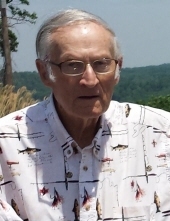 Eugene Bryant Smith, 86, of Cloverport, Ky, passed away Saturday, September 29, 2018 at his residence surrounded by his loving family. Gene has fought a long, hard battle with cancer for the last 9 months, but today he has defeated the disease. Gene was born June 23, 1932 in Fern Creek, KY to the late Arthur Washington and Ada Mae Griffith Smith. He married the love of his life, Carolyn Age Smith 54 years ago. He served his country in the Air Force and after his service he served as a firefighter for the Louisville Fire Department for 30 years. After retiring, he bought a hardware store in Cloverport, KY in 1987 and continued operating the venture until illness would no longer let him. He loved tinkling with small engines and one of the highlights of his life was aggravating and joking with the people around him. Besides his parents, he was preceded in death by several brothers and one sister. A Celebration of Life will be held 11:00 am Monday, October 1, 2018 at Cloverport Funeral Chapel, 208 East Main Street, Cloverport, KY 40111 with Rev. Arnold Moon and Bro. Wallace Gooch officiating. Burial will follow at Cloverport Cemetery. The family will receive friends and family from 3:00 pm until 6:00 pm Sunday at the funeral home. You may share your thoughts and memories of Gene with the family on our website: www.cloverportfh.com. To plant a tree in memory of Eugene Bryant Smith, please visit our Tribute Store. "Email Address" would like to share the life celebration of Eugene Bryant Smith. Click on the "link" to go to share a favorite memory or leave a condolence message for the family.